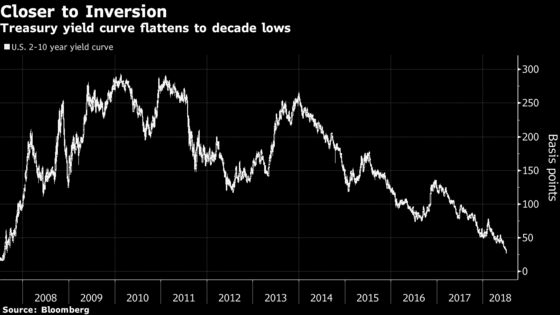 (Bloomberg) -- Bankers fretting over economic doom from an inverted U.S. yield curve may be creating a “self-fulfilling spiral” that derails growth. That’s the warning from Mark Holman, chief executive officer of TwentyFour Asset Management, a London fixed-income fund overseeing 13.5 billion pounds ($18 billion). The risk, Holman said, is that lenders are ushering in a slowdown as they pull credit out of alarm over an inversion of the yield curve -- a traditional harbinger of an economic contraction. And the dynamic could be set in motion as early as this year. Short-term yields have climbed this year on the back of faster growth, expectations of interest-rate increases and an uptick in Treasury bill supply. The two- to 10-year yield spread has fallen to less than 30 basis points while the gap between five- and 30-year securities dropped below 22 basis points, the narrowest since the summer of 2007. That’s stoking speculation the cash curve will soon invert, a dynamic which has preceded the majority of all U.S. recessions in recent decades. As the vanishing spread fans market fears, private banks ironically may be the trigger for disrupting the economic expansion, according to Holman. Already, JPMorgan Chase & Co. is providing clients with advice on ways to insulate investments against a recession, suggesting the U.S. dollar and Japanese yen are safest. For now, credit growth and lender profits are in rude health amid buoyant demand while treasurers are hedging interest-rate risks. Banks are also generating billions of dollars in trading income as well as fees and commissions amid capital-market activity like mergers and acquisitions. But the theory goes that a completely flat, or inverted, curve will depress net interest margins soon enough -- imperiling credit growth -- just as the U.S. expansion looks long in the tooth.